Seriously though, I do actual active things in my active wear, and if you’ve followed the blog at all you might recall the time I did the Burdastyle Activewear Course. It was a good course and if you want to get into sewing with stretch fabric, I recommend it as a good starting point. After the course I went and bought miles of stretch fabrics, most of which has been languishing in the cupboard for quite some time. Finally, I got around to redrafting a pattern for a sports crop top, and making it up in a couple of the groovier fabrics I’d found. First up was the blue not-quite-animal print. It fits okay around the bust but the shoulder straps are too long, it looks snug but does not provide enough support. As a practice run, though, it was a great success. I sewed the first side seam and then moaned for a few minutes because I’d messed up the tension and it was too loose…. then I realised something. Completely by accident, and back to front, but I had! I scribbled down those tension numbers right away, then finished that top and started the next one, this time in a bright geometric print with a contrast side panel. I’d found the bra had too much room in the front armhole, so I created a side-front panel and took a little wedge out of that seam. I got the flatlocking round the right way this time. Looks almost professional! As you can see it could probably do with a little more taken out. Both tops were lined in the front with white powernet. In the photo above it looks like only the side panel was lined, but I assure you it was the whole front. I did the edge finishes in two different ways. For the blue bra, I sewed elastic directly onto the fabric edge, stretching it a little as I went, just using a zigzag stitch. Then I folded it to the inside, and stitched it down – armholes with a zigzag again, and the neckline with a twin needle. This was an experimental piece after all, I just really wanted to see what various finishes were going to look like. On the green/geoprint top, I used a binding of the same fabric as the side panel, basically the same way you’d normally do a contrast binding, only stretching the binding as I sewed as I would have with elastic. The lower edge elastics on both were done the same way as the blue top’s armholes, only using a wider (and fairly strong) elastic. Have you tried sewing activewear? I’d love to hear what patterns you may have tried! Thanks Nikki! I’ll have to check out that Burda mag, I don’t think I have seen that one! Activewear, activewear… it’s the vid that just keeps on giving. 🙂 Entertaining even the third time I’ve seen it. 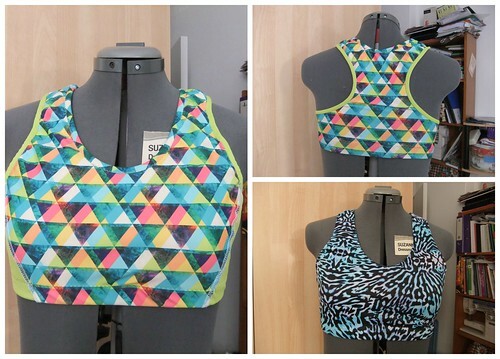 I keep telling myself that my activewear sewing is a WIP not a UFO. I think aiming to make a wrist band key carrier might be a more realistic target than finishing all my planned “activewear”. Yours on the other hand – so skilled!